Passive 3D Glasses with Polarized Plastic Lenses for LG Panasonic and Vizio Digital HDTV. It doesn't support shutter 3D TV. 3D glasses support Polarized 3D TV and Real D cinema. Polarized lens design eliminates the red / blue look for a more chic and classy style. Polarized lenses produce a clearer, higher image quality than the red / blue design. 2 Pair Passive 3D Glass with Polarized Plastic Lenses for 3D glasses/ . Condition is New. Shipped with USPS First Class Package. RealD 3D Glasses | 4 Pairs | Polarized Cinema 3-D . Condition is Used. Shipped with USPS First Class Package. 3D Passive Glasses. you will receive 5 adult glasses, and 4 children glasses. Passive 3D glasses without battery. 1x 3D Glasses. Crystal clear, flicker-free. Bright picture quality. Total Width:136mm/5.31". Ultra-modern design. 360 SOUND AND VISION High Quality 3D Glasses. 1x 3D glasses(Fit For RealD Cinema and Passive TV). Polarized lens design eliminates the red / blue look for a more chic and classy style. Polarized lenses produce a clearer, higher image quality than the red / blue design. Item Type: Circular Polarized Passive 3D glasses. 3D glasses support Polarized 3D TV and Real D cinema. Polarized lens design eliminates the red / blue look for a more chic and classy style. Polarized lenses produce a clearer, higher image quality than the red / blue design. For Vizio: M3D650SV, M3D550SR, M3D460SR, M3D420SR, E3D470VX, E3D420VX, E3D320VX. This 3D Passive 3D glasses support Polarized 3D TV and Real D cinema. Free from signal and wave interference. It's light and economical. Features:This filter is specially designed for DJI MAVIC PRO.Waterproof, oilproof and scratchproof.MCUV filter decreases blue cast and blue grey causing by ultraviolet ray, increasing light transmittance.CPL filter absorbs polarized light in the sky, reflective light of water or glass and other nonmetal material.Ultra thin, ultra light, high definition, high transmittance and low reflectivity.Premium optical glass, stable optical properties, high optical homogeneity.Description:Molded frame with accurate size, ultra-thin and no dark corners.Easy to use, directly install, convenient to operate.Multi-layer coating, no effect to self-inspection.Specifications:Material: aluminium alloy optical glass coatingColor: blackSize: 1.8*1.8*0.5cmThickness: 0.6mmType: MCUV filter, CPL filter. Passive 3D glasses without battery. 3.3D Glasses only,other accessories（if any）irrelevant demo in the picture are not included. Crystal clear, flicker-free. Bright picture quality. Total Width:136mm/5.31". This Clip-on 3D Passive glasses, which support Polarized 3D TV and Real D cinema, is specially designed for short-sighted people. Free from signal and wave interference. It's light and economical. Confirm your TV is Polarized 3D TV and 3D TV format before purchasing the 3D glasses. Polarized lens design eliminates the red / blue look for a more chic and classy style. Polarized lenses produce a clearer, higher image quality than the red / blue design. (If the Screen not 3D display, this Glasses can't show 3D funtion. ). Polarized lens design eliminates the red / blue look for a more chic and classy style. Polarized lenses produce a clearer, higher image quality than the red / blue design. 1x 3D glasses. This 3D Passive 3D glasses support Polarized 3D TV and Real D cinema. Free from signal and wave interference. It's light and economical. 1 Passive 3D Glasses. For LG: new 2012 model LM3400 series, LM6200 series. Product Type: Circular Polarized. Suitable for: No flash 3D TV, no flash 3D display, RD / MAX 3D theater. Not suitable for: general monitor, normal TV, shutter 3D TV, single head 3D projector. 1 Kids 3D glasses. Item Type: Polarized Passive 3D glasses. 3D glasses support Polarized 3D TV and Real D cinema. It doesn't support shutter 3D TV. Polarized lens design eliminates the red / blue look for a more chic and classy style. 3D glasses support Polarized 3D TV and Real D cinema. Item Type: Circular Polarized Passive 3D glasses. Polarized lens design eliminates the red / blue look for a more chic and classy style. Polarized lenses produce a clearer, higher image quality than the red / blue design. This 3D glasses have a beautiful appearance. Type: Polarized Passive 3D glasses. Polarized lens to reduce glare and increase picture clarity. 10 Pair of Passive 3D Glasses. These glasses don't protect your eyes from ultraviolet light. Item Type: Polarized Passive 3D glasses. It doesn't support shutter 3D TV. 3D glasses support Polarized 3D TV and Real D cinema. Polarized lens design eliminates the red / blue look for a more chic and classy style. 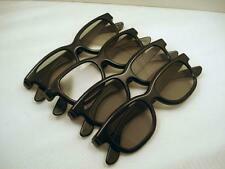 3D glasses support Polarized 3D TV and RealD cinema. Polarized lenses produce a clearer image quality than the red/blue design. Polarized lens design eliminates the red/blue look for a more chic and classy style. Model: G66. Type: Polarized Passive 3D glasses. Must have 3D film source and polarized 3D technology of TV needs refresh rate of 240 Hz or over 480 Hz. This 3D glasses have fashionable appearance with red and black color perfect combined. Polarized passive glasses generally can be used on TV / cinema / computer / and so on. Item Type: Circular Polarized Passive 3D glasses. Easy and simple clip-on type for eyeglasses wearer. Quantity: 2PCS (other accessories demo in the picture is not included). This Clip-on 3D Passive glasses, which support Polarized 3D TV and Real D cinema, is specially designed for short-sighted people. Free from signal and wave interference. It's light and economical. Type: Polarized Passive 3D glasses. Passive RealD Technology 3D glasses. Will work with all passive RealD technology compatible screens – the most common 3D technology on the market. - See crystal clear 3D motion pictures with RealD technology glasses on all passive 3D screens. Model: RD3. 3D glasses support Polarized 3D TV and Real D cinema. Item Type: Circular Polarized Passive 3D glasses. Polarized lens design eliminates the red / blue look for a more chic and classy style. This 3D Passive glasses support Polarized 3D TV and Real D cinema. Free from signal and wave interference. It's light and economical. Type: Polarized Passive 3D glasses. Confirm your TV is Polarized 3D TV and 3D TV format before purchasing the 3D glasses. The viewer wears eyeglasses which contain a pair of analyzing filters (circular polarizers mounted in reverse) of opposite handedness. Light that is left-circularly polarized is blocked by the right-handed analyzer, while right-circularly polarized light is extinguished by the left-handed analyzer. 3D glasses support Polarized 3D TV and Real D cinema. Polarized lens design eliminates the red / blue look for a more chic and classy style. Polarized lenses produce a clearer, higher image quality than the red / blue design. Type: Passive. This item is a pair of 3D glasses, which is made of durable ABS plastic. You can apply this pair of 3D glasses to enjoy yourself in the wonderful videos instead of going for a cinema. Take your own 3D Glasses to the Movies! In a movie theater, the reason why you wear 3D glasses is to feed and separate two different images into your eyes. Two projectors are synchronized and project two respective views.